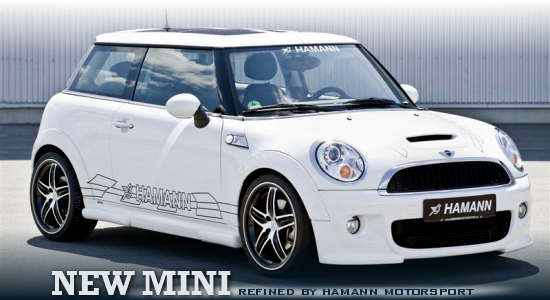 The universal high-performance and super car tuning house of Hamann Motorsport presents refinements for the new Mini. The car from BMW's British small premium car brand gets some add-on parts. In addition to the body kit, 18inch wheels are offered in several designs. Pilots of the Cooper models can also order performance upgrades. The diesel version's power increases to 136hp while the strongest option for the petrol motor has remarkable 230hp. There also is a version that cranks out 'just' 204hp. Truly a good rate for a racy midget like that! Accordingly adapted driving behaviours can be installed by either a set of springs or a coilover suspension which lower the car body by 30 and up to 50mm respectively. For the interior, the specialists of Hamann hold further things on store to make the new Mini sportier or more luxurious and even individual solutions could be arranged.